Before I set out on my trip to Southeast Asia, the only thing I knew about Laos was that it was the only landlocked country in the region. Laos just seemed like a convenient stop between Thailand and Cambodia. After coming back, I can now say that Laos was the absolute highlight of my trip. It has a little bit of everything, so every kind of traveler will have an amazing time here! If you can, spend a few days floating along the Mekong River in a slow boat run by locals. You’ll float through lush jungles and small villages while the locals cook Laotian food for your time on the boat. If you’re lucky, you might even see an elephant on the riverbank! On the way, you can visit Buddhist cave temples next to the Mekong. You can stay in one of the small villages overnight and float through the river again the next day. Laos was previously a part of the French Colonial Empire, so you can have some yummy French pastries for breakfast before setting off for another day on the boat! Luang Prabang and Vientiane are perfect for the traveler who wants a little bit of everything! You can bike around the city and visit some of Laos’ iconic temples. You should also try snake whiskey (a local delicacy – really strong whiskey fermented with snakes and other critters) that goes for about $0.70 USD per shot. My favorite thing about Luang Prabang was the Kuang Si Waterfall. The water is an awesome milky blue color (that looks amazing on Instagram – filter or not!) and you’re allowed to swim in it! This waterfall was probably the most picturesque place I’ve ever been. Vientiane is the capital of Laos and the architecture and history are the main highlights. The reclining Buddha and intricate paintings in the temples are amazing. Try to take a local tour, you’ll learn more about the history and culture of Laos! 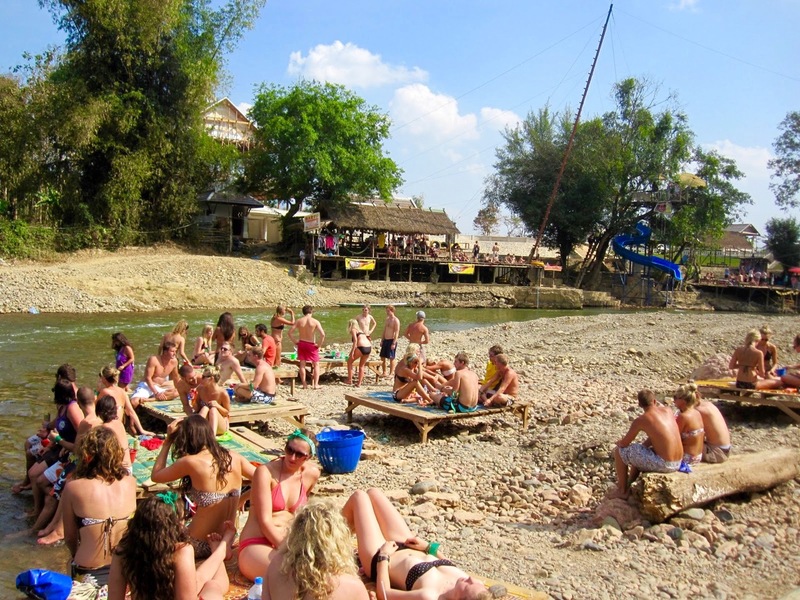 The place that party and adventure travelers will love the most is Vang Vieng. This backpacker’s town used to be a US airbase and has the most amazing atmosphere. There’s lots of western-style bars to party at, and since the town is on a river, you can also kayak, tube and zipline. There’s also amazing cliffs around Vang Vieng that you can climb! Visit the bars along the river for a little bit of adventure and party. Vang Vieng is worth a visit!